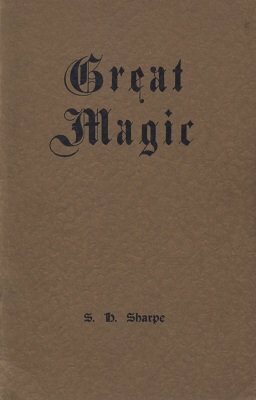 When Neo Magic was finished I thought I had said all there was to say on "The Art of the Conjurer"; but before that book was off the press I found myself jotting down fresh observations on this fascinating, though neglected, subject. Magic Artistry is the result, which may be said to supplement Neo Magic . Many of the ideas put forward herein will be new to most conjurers; and, through being strange, may seem obscure or outlandish; but such an impression will doubtless pass as their meaning is grasped; though this may not be until the book has been carefully studied several times to get the mind in harmony with the ideas expressed, so that the two cleave. Conjuring is not all tricks. If the reader has reached the stage of wanting something beyond tricks out of magic, he may perchance find clues in the pages of Neo Magic and the present volume that will lead him to what he seeks: and having found it, he will not turn back; for who would willingly return to earth after once having visited the Elysian fields. 1st edition 1938, 67 pages; 1st digital edition 2019, 61 pages.